Our elegant “Diamond” glass stems are 100% made in Germany. Each stem is manufactured by hand and is therefore a sign of unique craftsmanship. Subsequent quality inspections and testing ensure the excellent quality of our products. All stems have a 29/2 ground glass joint and are compatible with our Steamulation hookah models. The name of the series originated from the special form of the stem: The six arms of the column form the shape of a diamond. 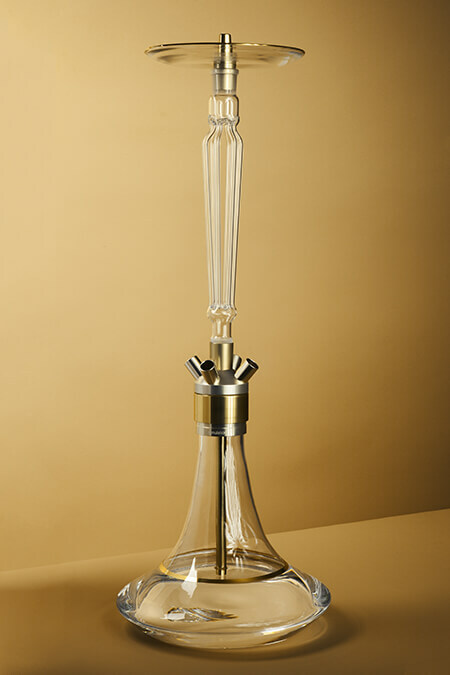 The stems are 38 cm high and are made of borosilicate glass. The glass stem Diamond Clear is designed transparently and features six glass arms promoting an optimized airflow. It is made of borosilicate glass for highest stability and durability. 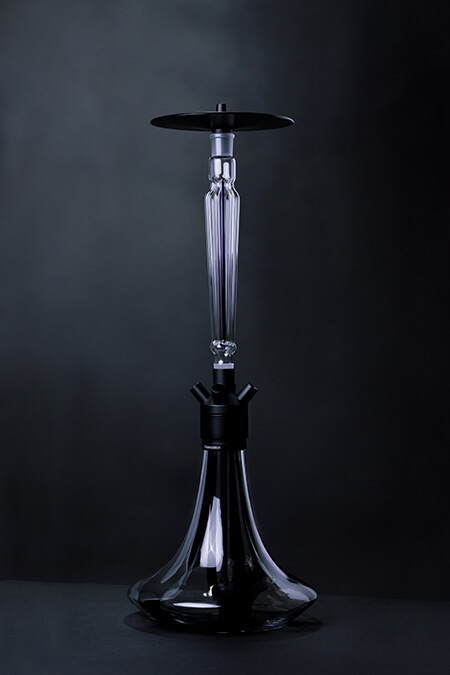 The glass stem Diamond Black is characterized by the black element in the centre of the six-armed column. Thus, it matches every Steamulation hookah model. The glass stem Diamond Blue features a vertically aligned blue element in the centre of the six arms of the stem. We recommend combining the Diamond Blue with the matt black finished Steamulation Superior Black. The Grand Diamond series is characterized by the integrated molasses catcher. The filter is embedded by hand above the six arms of the column and prevents the drainage of molasses into the stem. Every stem is produced in sophisticated handicraft in Germany to ensure best quality. The colour elements are inserted into the glass lovingly by hand and add the finishing touches to the magnificent stems. 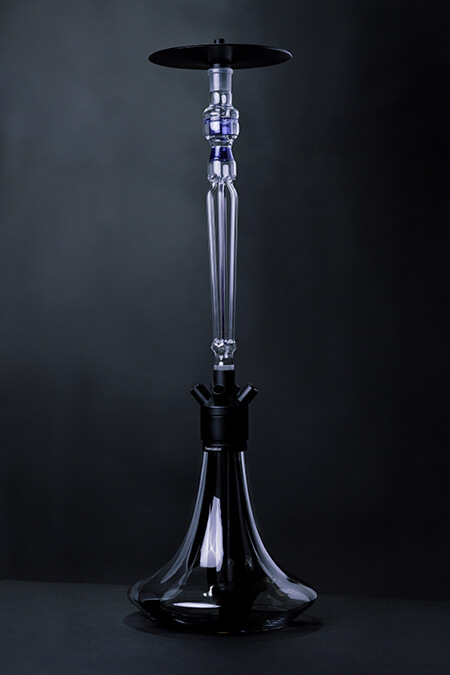 The Grand Diamond stems are 46 cm in height and are made of borosilicate glass. The Grand Diamond Black is the big sister of the Diamond Black. The stem features an integrated molasses catcher which is inserted into the glass above the diamond structure by hand. With its six-armed design, the Grand Diamond Black promotes a perfect airflow. Moreover, like all other Steamulation glass stems, it is 100% Made in Germany to guarantee the best quality. The Grand Diamond Black adds the finishing touches to your hookah. The Steamulation Grand Diamond Blue is based on the Diamond Blue. Besides additional 8 cm in height, the Grand Diamond Blue differs from the Diamond Blue in its conception: It includes an integrated molasses catcher. It is inserted into the glass by hand and highlights the high quality of the German glass works. We recommend combining the Grand Diamond Blue with the Steamulation Superior Black.